This week’s Throwback Thursday feature is from the August 2008 magazine edition of Australian Aviation, where Andrew McLaughlin looks at the introduction of the Embraer E-Jet into the Australian market. Embraer’s E-Jet line has arrived in Australia in a big way, with no fewer than three operators launching services with the class-leading E-170 last year. 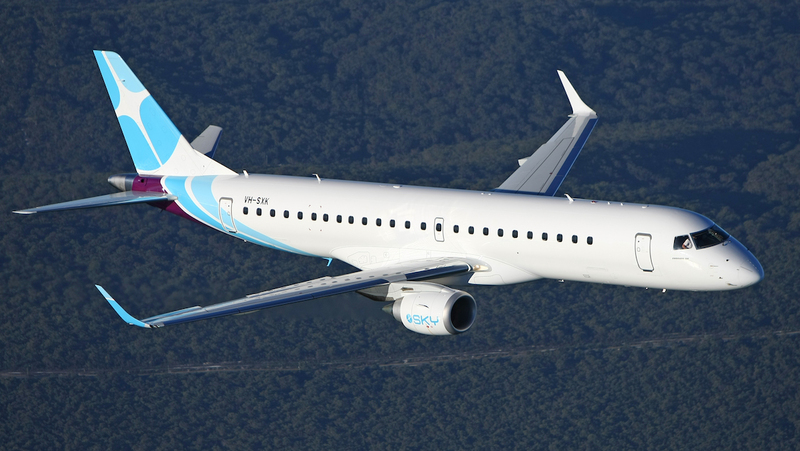 Brisbane based charter and RPT start-up SkyAirWorld (SAW) was first off the mark with its introduction of a former Hong Kong Express E-170 last May. The 76-seat aircraft initially operated on a short-lived wetlease to Solomon Airlines on the Brisbane-Honiara run before its employment was widened to ad hoc fly-in/fly-out (FIFO) and other charter missions, and eventually onto its own RPT services to and from the Solomons. SAW followed the E-170 up with the introduction of its first of up to four 100-seat E-190s earlier this year, one of which has been employed on a wetlease to Air Niugini as well as other charter work, and also added two ERJ-145s which will be employed mainly in Queensland servicing Brisbane-Cloncurry-Cairns and on some ad hoc work. Right behind SAW was Darwin-based Airnorth which introduced an E-170, also a former Hong Kong Express aircraft, on its northern network last August, servicing Perth, the Macarthur River mine, Kununurra, Broome and Denpassar from Darwin, as well as ad hoc charter services to Dili and even as far afield as Manila in the Philippines. Indeed, Airnorth announced in early July that it would be adding a second E-170 to its fleet from next April, a new build aircraft direct from Embraer which will be the first E-170AR (for Advanced Range) to enter airline service anywhere. “This will see us capable of operating services direct, and fully loaded, to every Australian capital city as well as Jakarta, Kuala Lumpur, Manila and many other destinations,” said Airnorth’s CEO, Michael Bridge. 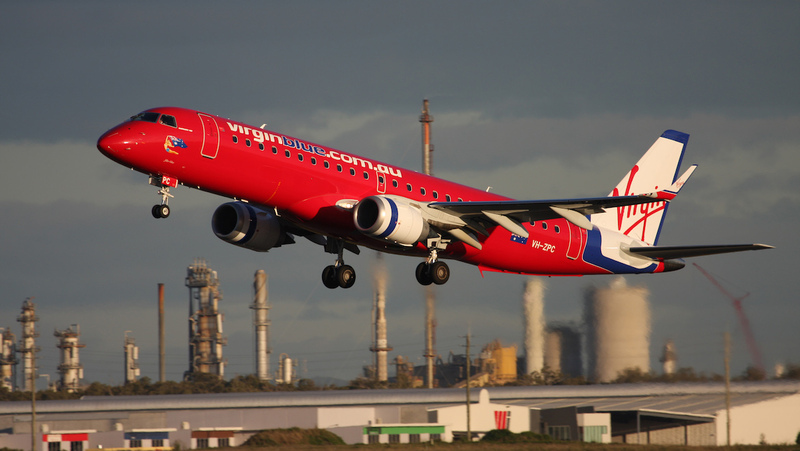 But undoubtedly the biggest player in the field is Virgin Blue with its late 2006 announcement of an initial order for what will become a fleet of at least 20 E-190s and E-170s with a view to taking on the regional market as well as renewing its commitment to the Canberra-Sydney route. Virgin’s first three aircraft were E-170s which started entering service last October, initially flying Brisbane-Cairns and Brisbane-Canberra, before in February starting ‘Capital Jet’ high frequency Sydney-Canberra services, plus flights from Sydney to Albury and Port Macquarie. 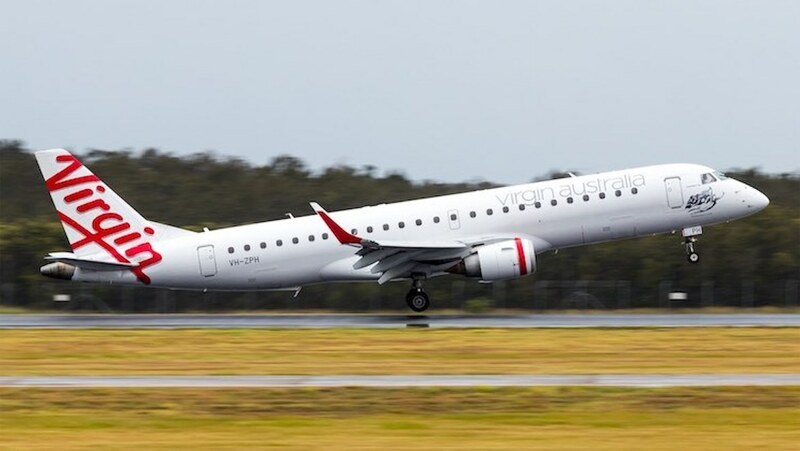 Further E-170 flights have been added between Canberra-Gold Coast, Mackay-Sydney and Rockhampton-Sydney, while a fourth 170 joined the fleet in June. Since March this year Virgin Blue has taken delivery of its first four E-190s, and these are now being deployed on the Canberra-Brisbane and Canberra-Sydney sectors, as well as Brisbane-Mackay, Brisbane-Rockhampton, Canberra-Melbourne and Brisbane-Adelaide services. 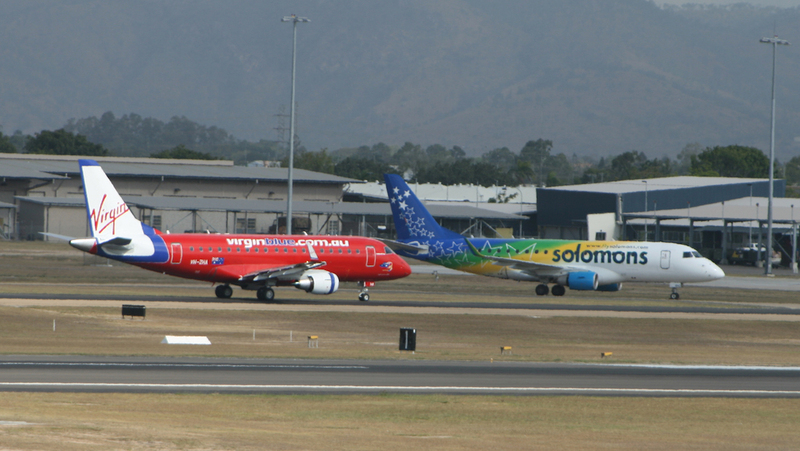 Looking at Virgin Blue’s utilisation of its E-Jets, it’s clear that the aircraft is being operated with much more utility than just as a traditional regional jet, although they have clearly been positioned against QantasLink’s Q300s and Q400 on routes such as those along the central Queensland coast and to Port Macquarie and Albury. 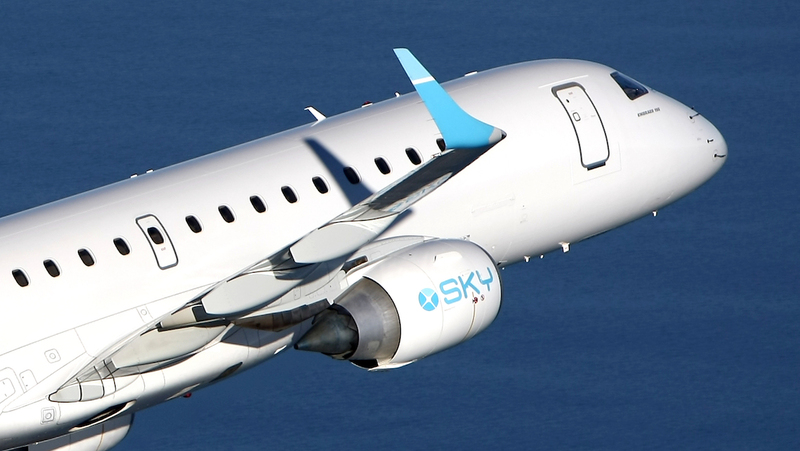 But with crude oil passing US$140 a barrel in late June, the E-190s especially and to a lesser extent, the E-170s, appear to be finding a valuable niche as Virgin looks to “down gauge” to the more economical E-Jets on some of its thinner off-peak services where it is often difficult to fill a 737, with the Brisbane-Adelaide, and Canberra-Melbourne sectors being prime examples. 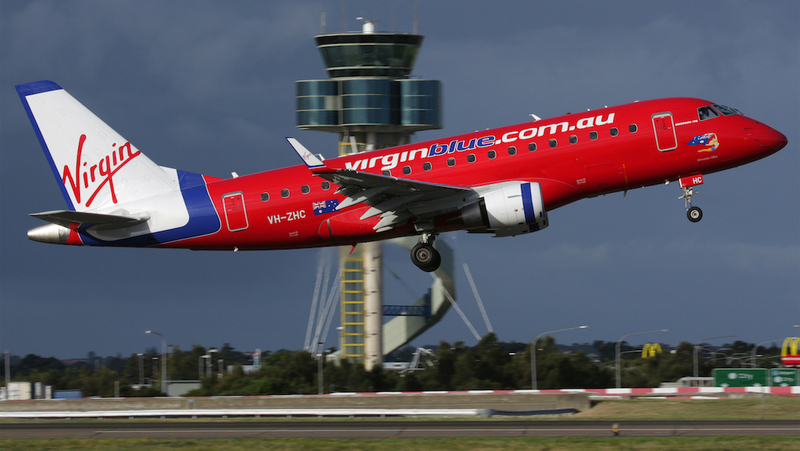 “There were a number of factors that Virgin Blue considered and an extensive amount of research was done prior to coming to our final decision of purchasing the E-Jets,” Virgin Blue CEO Brett Godfrey told Australian Aviation. Godfrey said when choosing the E-Jet, the airline was looking for efficiency, it had to have a quicker flying time than the competition’s Q400 turboprops, its range and flying capability, a smooth and comfortable ride, and the level of passenger satisfaction in terms of the cabin interior. “We looked at a number of (other) aircraft types, both turboprop and jets, including the Bombardier CRJ series, Boeing 717 and 737-600, and the Airbus A318,” Godfrey said. But “having a generous height in the cabin as well as 2+2 seating that gives the aircraft an ‘executive jet’ feel” was an important element in choosing the E-Jet. Airnorth says it chose the E-170s based on the type’s performance in hot conditions common in the areas in which it operates, as well as its speed, capacity, comfort and reliability compared to turboprops. 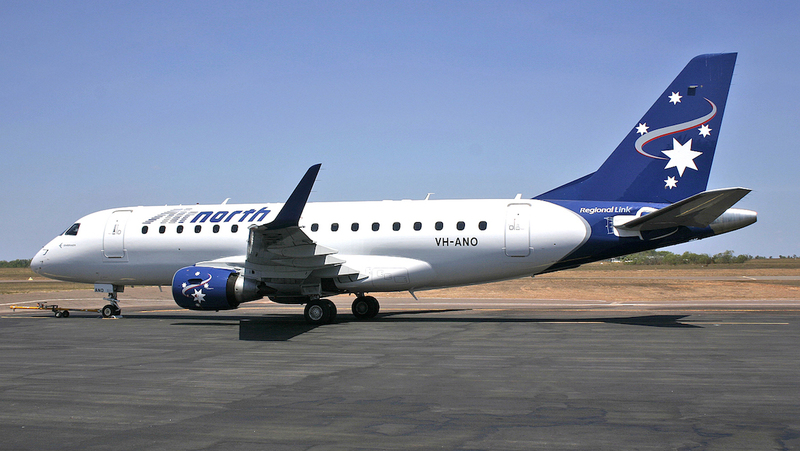 Airnorth says the E-170’s “superior cabin spaciousness, generous under-floor cargo capacity, state-of-the-art avionics, fly-by-wire technology and uncompromising performance” are all important in the top end’s harsh environment. The airline is also a long term Embraer operator, having flown its EMB-120 Brasilia turboprops for nearly a decade. At SkyAirWorld, the E-170 makes daily hops across the Coral Sea to Honiara in the Solomon Islands from Brisbane and return, and has proven popular with regular passengers supporting the Australian government’s RAMSI mission there and leisure travellers alike, while the E-190 performs regular Brisbane-Sydney-Port Moresby runs for Air Niugini. “In terms of direct comparison to other regional jets in service, the only other platform we considered was Bombardier’s CRJ700/705/900 family,” SkyAirWorld CEO David Charlton told AA. “We chose the E-Jet as it was available directly through an aircraft lessor, and we felt that it offered a more compelling passenger experience, but we certainly acknowledge the other positive attributes of the Bombardier product. Virgin Blue says its five E-Jets in service at the end of May had flown over 5780 hours, and that they are performing well against expectations for a new aircraft type which is still developing and maturing. “The aircraft is proving it has great ‘street appeal’, so to speak”, said Godfrey. “From the feedback we have had, the aircraft is extremely popular with passengers who enjoy the extra space and the 2+2 seating configuration, and especially the height of the aircraft ceiling and not having to bend over to walk through the cabin. The ability of the aircraft to dock at an aerobridge is also popular, and guests have appreciated being able to walk straight from the aircraft to the terminal, especially in bad weather. “Our dispatch reliability figure that we agreed with Embraer is just slightly below what has been agreed with Boeing for the 737s. “While we expect an initial year of bedding in with the E-Jet and allowing our team time to settle in to the new aircraft type, our expectations are that the E-Jet fleet will have the same reliability in the long term as the 737 fleet. This reflects the fact that the E-Jet is a new aircraft type in this market and for this airline. The E-170 has been in operation for eight months while the E‑190 has been flying for four months, and it has been a learning curve for all those who handle the aircraft including pilots, ground handlers and engineers. But we are pleased to say that dispatch reliability is very close to the overall target and we are overall happy with the aircraft’s reliability. 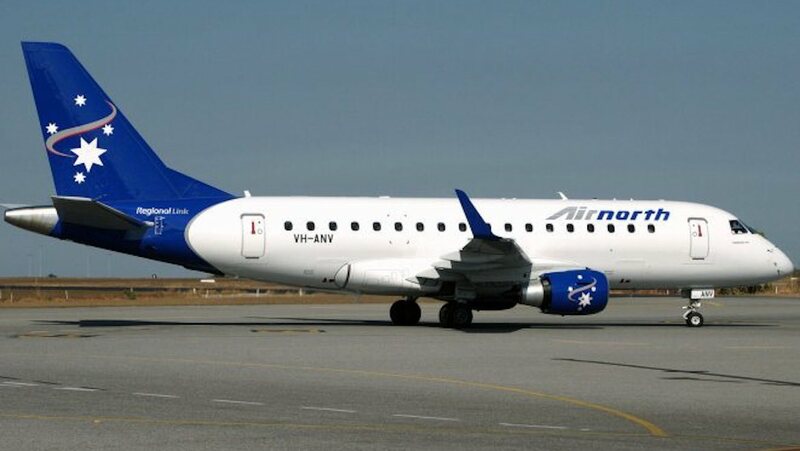 Airnorth says it has logged about 1750 hours on its E-170 since it entered service last August, and has only experienced two service issues of the aircraft’s doing in that time that have led to the aircraft being unavailable, giving a better than 99 per cent dispatch reliability figure. “The customer response to the first aircraft, in every single market that we have operated it, has been overwhelming,” Airnorth deputy CEO Simone Saunders said. From a pilot’s point of view, the aircraft is also well regarded. “The fly-by-wire flight controls along with the Honeywell electronic flight displays have made the aeroplane very pilot friendly,” Virgin Blue’s technical operations manager Embraer, Captain Paul Considine, said. “The aircraft has been very well accepted by the pilot group with many of the seconded pilots happy to stay with the Embraer for as long as they can,” Captain Considine added. “From a training perspective the aircraft is extremely well equipped and has a very sophisticated avionics fit-out,” said SkyAirWorld’s check and training manager, Captain Peter Bulley. “These aircraft are good platforms for pilots with previous experience on turboprop aircraft or general aviation backgrounds to transition to flying jet aircraft. Most of the pilots flying jets for the first time quickly adapt to flying the aircraft, and we have found that the time required to train our pilots is very similar whether they have previous experience on jet or non jet aircraft. “One of the great things about an aircraft with a completely integrated avionics suite is that there are very many pieces of data that are available for trouble-shooting, reliability monitoring and performance analysis,” SkyAirWorld’s Howell added. The high level of automation provides a level of protection not available in some other aircraft, while still allowing the pilots to fly the aircraft if they desire,” added Peter Bulley. SkyAirWorld says it is yet to fully realise the potential fuel savings of the E-Jets, but that these are improving as the aircraft matures. There are two other members of the E-Jet stable which we are yet to see in Australia, these being the shorter ranged but higher capacity 84-seat E-175 and the 112-seat E-195, both of which have found favour on denser sectors in Europe and the US. But there appears to be little interest in these variants here due to their being less flexible over some of the longer sectors commonly flown by Airnorth, SkyAirWorld and Virgin Blue. “It is of course all subject to market demand,” said Godfrey. “Given that range is very important in our operations in regional Australia and the Pacific, the 175/195 offerings do not appear to be right for us,” said Charlton, noting that he remains open should a market opening appear. 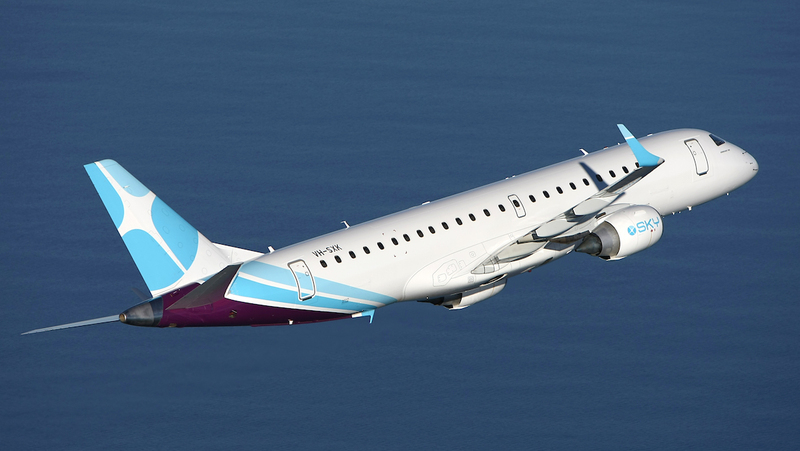 So with another E-170 on the way for Airnorth, another E-190 later this year and possibly two more next year for SkyAirWorld, and a further 11 E-Jets on order for Virgin Blue, the type’s long term future in Australia appears assured. 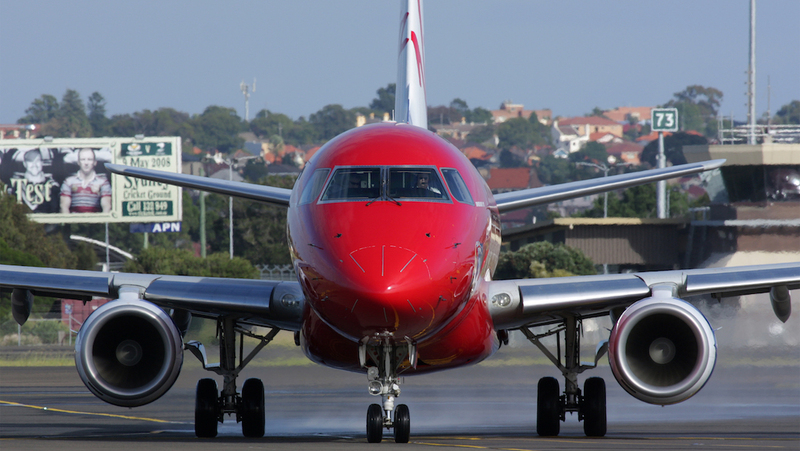 The E-Jet looks to have re-defined the standard for regional jets in Australia and the region. VIDEO: The handover party for Virgin Blue’s first Embraer E170 in 2007, from Rogerio Naccache’s YouTube channel. This article originally appeared in the August 2008 magazine edition of Australian Aviation. It is quite disconcerting to think that 10 years have elapsed since VirginBlue, as it was known back then, introduced the E170!! Only seems like yesterday. Time flies at a frighteningly rapid speed indeed! We are also rapidly approaching two decades since the collapse of Ansett Australia, yet that still seems so fresh in mind too. Am I just getting old?! What’s that old adage, “Seize the day!” Make each one count…and include time for a daily read of Australian Aviation, of course! !